Today at Adventures of Cecelia Bedelia I’m interviewing Sylvia Izzo Hunter, author of (the absolutely fantastic debut) The Midnight Queen and its follow-up Lady of Magick. These books are my version of bookish catnip - completely irresistible, lovely, and smart all in one go. 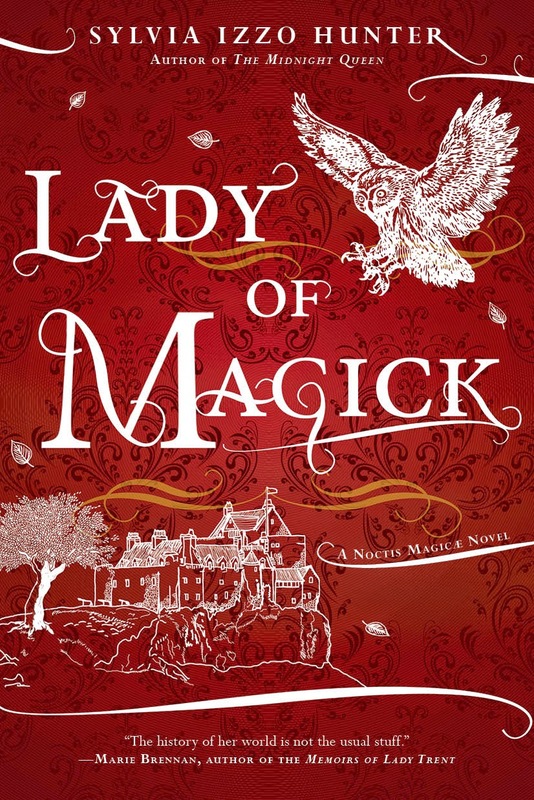 Check out the end of the post for your chance to win a copy of Lady of Magick! Sylvia Izzo Hunter was born in Calgary, Alberta, back in the days before Star Wars, and started making up stories at approximately the time she learned to talk. A couple of decades ago she moved to Toronto, Ontario, where she now lives with her husband and daughter and their slightly out-of-control collections of books, comics, and DVDs. She studied English and French literature (with a particular focus on medieval and Renaissance poetry and drama) at York University; she has since discovered that her mom was right: in order to be a functioning grown-up, you really do need to know how to do math. Over the course of her working life Sylvia has been a slinger of tacos, a filer of patient charts and answerer of phones, a freelance looker-up of unconsidered trifles, an Orff-singing stage monk, and an exam tutor, but has mostly worked in not-for-profit scholarly publishing, where she started out making lots of photocopies and now gets to make XML and EPUB files (which is more fun). She also sings in two choirs (including the Orpheus Choir of Toronto), reads as much as possible, knits (mostly hats), and engages in experimental baking. Sylvia’s favourite Doctor is Tom Baker, her favourite pasta shape is rotini, and her favourite Beethoven symphony is the Seventh. What was the most surprising/strange thing you learned while doing research for The Midnight Queen? OK, given the cover of the book, hopefully it's not spoilery to say there's an owl in it? Anyway there's an owl, so I did some research on owls generally, and on this particular type of owl -- it's a Great Grey Owl, Strix nebulosa lapponica; the owl on the cover I'm pretty sure is a barn owl, but isn't it beautiful? -- so I would have a clue about things like its wingspan, what its various calls sound like, how big it is, and so on. And wow, SO MUCH of an owl is just feathers! Inside the feathers, an owl's body is kind of a stereotypical vulture shape, with the switchbacked neck. It's a bit disconcerting actually. Who do you think is the perfect/ideal/likely reader for your books? Also, this book isn't categorized as YA, but I think any YA reader who can enjoy Jane Austen might also like The Midnight Queen [and Lady of Magick]. The youngest reader of TMQ that I know of so far is twelve. She had some Serious Questions for me about my use of Greek and Roman mythology. What is one fantasy novel I absolutely must read? Well, I could make a lot of recommendations, but if I had to pick just one: you absolutely must read Paladin of Souls by Lois McMaster Bujold. The setting is based on mediaeval Spain, the protagonist is a 40-year-old widow whose family keeps trying to protect her from herself, and it's got fighting, sorcery, explosions, cunning plans, romance, trickery, and a god with a naughty sense of humour. And it's Bujold, so you know every sentence, every word in fact, is right where it should be. I see that you read a lot of SFF YA. What's one recent YA book that you wish had been around when you were a teenager? Wow, so many! (I do wish I'd known about Tamora Pierce's early books when I was a teenager: way better role models than Piers Anthony!) But I'm going to pick Holly Black's Faerie books, and particularly the middle one, Valiant, which is about seeing past the surfaces of people, including yourself. If you could host a dinner for fictional literary characters, who would you invite, and what would you serve? So first I'm going to pretend that I'm not really, really shy IRL, and could actually do this thing. OK … Go! I would definitely invite some people from Jane Austen's Persuasion: Anne, Frederick, and Admiral and Mrs. Croft. (And I would beg, borrow, or steal a piano so that Anne could play it and we could all sing.) Also, I would have Miles and Ekaterin and Aral and Cordelia and Ivan from Bujold's Vorkosigan books, and of course Ista dy Chalion from Paladin of Souls. I would very much like to have Will Laurence and Temeraire from Naomi Novik's Temeraire books, but I'm already not sure where I'm going to put all these people, never mind a fully grown Celestial dragon! Possibly we could have the dinner party on the roof of the building, but even so. I'd invite Door, from Neil Gaiman's Neverwhere, and she could finally finish reading Mansfield Park. Carmichael and Jack from Jo Walton's Small Change series, and Patricia from My Real Children. Hermione Granger, because Hermione is awesome and my daughter would enjoy hanging out with her. Ned and Verity from Connie Willis's To Say Nothing of the Dog, and the long-suffering Badri. And some detectives: Roderick Alleyn and his wife, Troy; Albert Campion; George and Bunty Felse, and their son, Dominic, and his girlfriend, Tossa; and Tommy and Tuppence Beresford. And Angela Carter's Dora and Nora Chance, to liven things right up. What books are on your nightstand (or your to-be-read list) right now? Oooohhh I really need to make some reading time! Currently reading The Firebird by Susanna Kearsley and Lex Talionis by R.S.A. Garcia. Sylvia Izzo Hunter brought “both rural Brittany and an alternative Regency England to vivid life” in The Midnight Queen, her debut novel of history, magic, and myth. Now, in her new Noctis Magicae novel, Sophie and Gray Marshall are ensnared in an arcane plot that threatens to undo them both. In her second year of studies at Merlin College, Oxford, Sophie Marshall is feeling alienated among fellow students who fail to welcome a woman to their ranks. So when her husband, Gray, is invited north as a visiting lecturer at the University in Din Edin, they leap at the chance. There, Sophie’s hunger for magical knowledge can finally be nourished. But soon, Sophie must put her newly learned skills to the test. Sophie returns home one day to find a note from Gray—he’s been summoned urgently to London. But when he doesn’t return, and none of her spells can find a trace of him, she realizes something sinister has befallen him. With the help of her sister, Joanna, she delves into Gray’s disappearance, and soon finds herself in a web of magick and intrigue that threatens not just Gray, but the entire kingdom. Would you like a copy of the book for yourself? You're in luck! The publisher will send a finished copy to one lucky winner. To enter, simply fill out the FORM. Giveaway open internationally, will end on Friday, September 25 at 11:59pm EST. Winner will be selected randomly and notified via email. Good luck! Fine print: I did not receive any compensation for this post, and the publisher will provide the giveaway prize. And Hunter should read The Grass King's Concubine; it's amazing!